Good morning, everyone! I hope ya’ll had an awesome weekend. If you read my Sunday Chit Chat post from last night (https://psmeganelizabeth.wordpress.com/), I had talked about some exciting things I was gonna blog about for ya this week. Welp, today is one of them: hair chalking tutorial! For the first time ever last night, I finally got around to using hair chalk! This is something that I’d been wanting to do for quite some time and I just now made room for it. I took lots of pictures along the way, so if this is something you’re interested in doing yourself, defiantly keep reading! This is the hair chalk that I used. 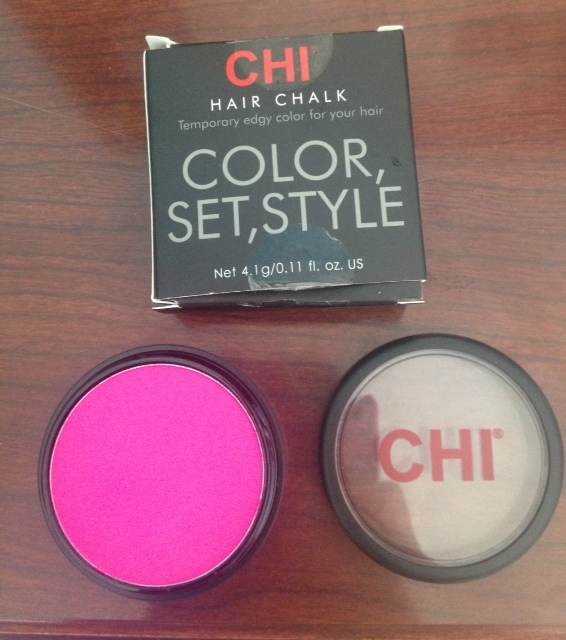 I don’t know how much this Chi brand hair chalk sells for because I actually got this included in the package when I bought my new straightener recently. But, when it comes down to it, I know that you actually don’t even need to use hair chalk, you can just use normal chalk (or so I’ve heard from Pinterest). I wish I woulda swatched this on my wrist, so you could see just how pigmented this chalk is, but trust me, what you see right there is what you get! It was so ridiculously pigmented. When you get this product on your hair, it’s literally this exact same color. Crazy color payoff! First things first: always start with wet hair! You cannot do this on dry hair and expect good results. I just did my hair chalking after I got out of the shower, so my whole head was wet, but you can also just spritz the sections that you wish the color with a spray bottle. Bottom line: just make sure your hair is wet! The hair chalking process itself is actually not too difficult. I know that there’s a hair chalking device out there that looks just like a mini straightener and you just clip your chalk blocks on it so you don’t have to use your hands. But, I personally feel that, unless you’re chalking your hair quite often, it’s pointless to pay money for something like that. So I just used my hands! All you do is just take your chalk, press it on to your wet hair, and run it slowly down the length of the strand. It helps if you do both sides of your hair. And that’s all! You can choose do this all over, just one streak, on one side, every other strand, whatever! The possibilities are endless. I just decided to do mine mainly on the ends of my hair. Alright, now let’s get serious. 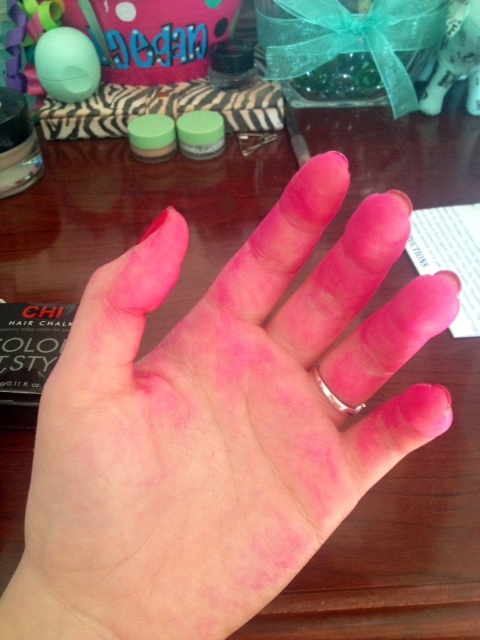 I’m about to drop a bombshell on you: I hate hair chalk. I didn’t think I would, but I do. I hate it with every inch of my heart. You can’t tell by looking at this specific picture, but the hair chalk dries out your hair instantly. It was almost like my ends were completely fried. I couldn’t even run my fingers through it, let alone a brush, as the instructions tell you. Plus, it did this to my hands. So not cool. 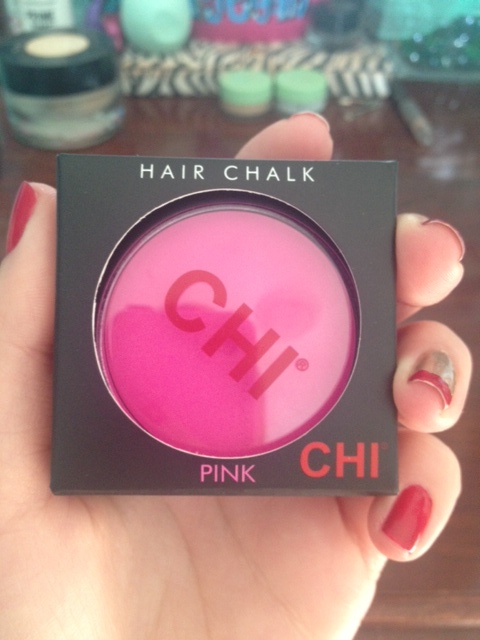 Normally, hair chalk will wash off easily with soap and warm water, so I don’t know if it was just this Chi brand or what, but this stained my hands. Right now as we speak, my hands still look like this. It looks like I murdered a cartoon character. Annnnnd, this is what it looks like after I dried it. I don’t know if ya’ll can see just how dry it is in this picture, but I sure can. If you’ll just scroll back up for a sec and notice in my wet hair picture and how I only did certain strands and just the ends of them…. 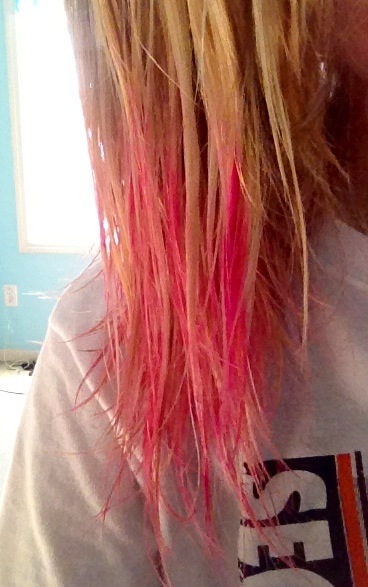 yeah, after I finally manged to rip a brush through my straw-like hair, it completely moved the color around. 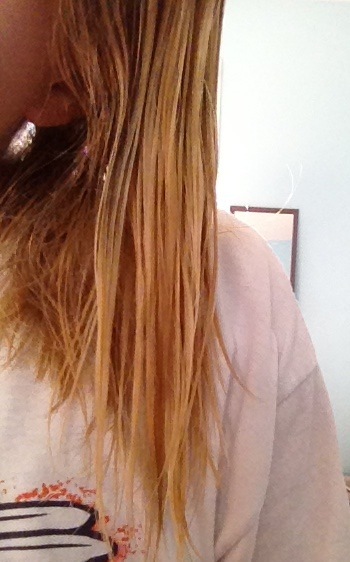 I ended up with color clear up to the roots of my hair… not even CLOSE to where I had applied it. Brushing it (reminder: the instructions told me to do so) pretty much ruined the streaky look I had goin’ on. It just blended everything together until I looked like a 12 year old girl going through a rebellious phase. 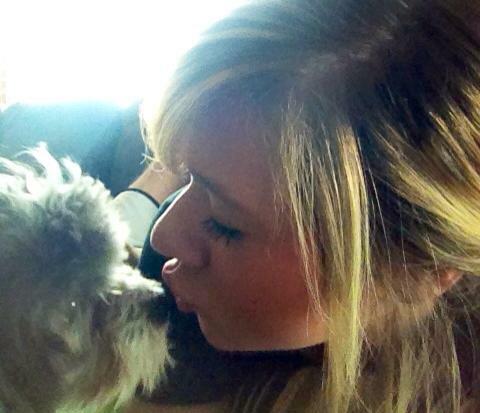 And, ladies, I’ve bleached my hair before and that turned my hair into a tangle-y, matted mess. 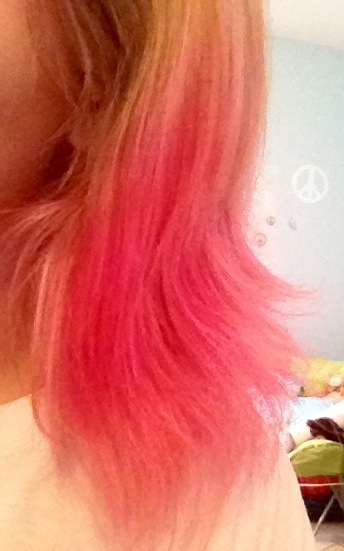 Hair chalking pretty much gave me the exact same results as bleaching, so that’s pretty horrible. Bless my mom’s heart though, she helped me attempt to get the color out of my hair (after laughing at me first. haha). We washed my hair in the kitchen sink, I kid you not, SEVEN times (and once with Dawn dish soap!) to try to get the color out. Luckily for me, most of it did fade. It’s still got a pink tint to it today and I have it pulled up in a ponytail to keep people at work from noticing my bad hair experiment, but it did fade somewhat. I think using the Dawn dish soap was my saving grace last night. We also applied a deep conditioning treatment and left it on for about 30 minutes, but my hair is still pretty dry and damaged this morning. As always, if ya’ll have an questions at all, leave me a comment down below. I hope you enjoyed my failed attempt at hair chalking and if any of you plan on doing it in the near future, I wish you the best of luck. haha I hope you get better results than what I got. Don’t forget to give me a follow for some other exciting posts that I’ve got comin’ up this week for ya, thanks for reading today, and I’ll talk to ya’ll later! ← Sunday Chit Chat: Wedding Edition! Wow that is bright. I’ve worried with hair chalking that I might get it on my clothes.Did any of it transfer onto your shirt? It sure did! I should have mentioned that haha It completely stained and ruined one of my shirts, so if you do it, make sure it’s an old shirt that you won’t miss! Wow… Sorry it was so bad… I’ve never tried it but I’d be even more skeptical now… love your honesty!